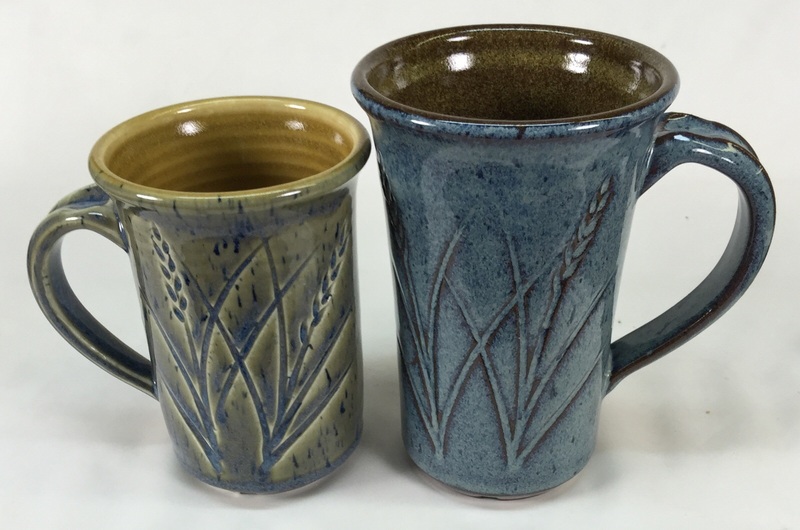 Mix your own floating blue: This is Ravenscrag Slip G2917 on porcelain (M370) and a red stoneware (M390). We consider cone 4-7 in electric kiln firings as "Medium Temperature" (the term "Cone 6" is also used loosely to refer to medium temperature fired in an electric kiln). Very few people fire to cone 7 or 8, most at cone 6. Some at cone 5. Kilns capable of cone 6 are relatively inexpensive. With the right additions, cone 6 clays can vitrify and glazes can melt to be just as strong as ware made at cone 10 reduction, however extra attention to detail is needed for success. Fired to cone 10 oxidation is not normally considered worthwhile (especially for the viewpoint of kiln wear-and-tear and energy consumption), this is because equal strength and hardness can be achieved at cone 6 using a body and glaze designed to work there (cone 10 glazes can also be reformulated to melt lower). Why is Cone 6 More Difficult Than Cone 10? A cone 10 body recipe that fires strong and vitreous needs minimal feldspar. This leaves plenty of room in the recipe for plastic, light burning stoneware clays that are abundant in nature. At middle temperature much more feldspar is needed (and even other helper minerals like talc, spodumene). This leaves less room in the recipe for clays and necessitates the use of bentonite to boost plasticity. Common and inexpensive glaze melters (like feldspar, calcium carbonate, dolomite) flow very well at cone 10 to produce a glass of low thermal expansion. But not at cone 6. It requires specialized, more expensive melters (like frits, Gerstley Borate, zinc oxide, spodumene). Glaze recipes require extra attention to have a low enough thermal expansion (to prevent crazing). Why is the Extra Attention Worth it? The measures needed to accomplish cone 6 success are well known. What do you get? A wider range of glaze effects is possible in middle-fire. Especially color (higher temperatures mute color). A large number of books and web sites are dedicated to middle temperature and the myriad of effects you can achieve. Fired results are more consistent than at cone 10 reduction. Energy costs are lower and kilns last much longer. A wide range of commercial underglazes and glazes are available. Cone 5 or Cone 6? Generally Plainsman our bodies are targeted to be "as mature as is practical" at cone 6 (not vitreous enough that accidental over firing would cause issues). The target maturities generally fire to surfaces that are variegated and 'warmer' in color (higher temperatures produce a more solid homogeneous, stony color; lower ones look more like the bisque. Electric kilns not have good air flow so you must allow time during the early stages (for ware to expel the water and for the vapor to drift out, or be pulled out if your have an exhaust system). Electronic kiln controllers are used in middle temperature kilns now and these provide the capability of programming a slow ramp at the beginning (we recommend manual programming over using the built-in programs). Additionally they make it possible for a precisely controlled soak (or drop-and-soak) at the end of the firing to assure pinhole and blister-free glazes. We recommend monitoring firings closely to make sure that they are in fact going to the temperature your controller is set to (very likley they are not). Be aware that different zones in the kiln often fire to different temperatures. Use cones in your firings to verify and adjust the program to compensate as needed (for example, if you your program fires to 2190F and cone 6 is no even started, then increase that, perhaps to 2210F). Middle temperature provides some of the advantages of both high and low fire glazes. As noted, the main fluxes used at high temperatures (e.g. feldspars, dolomite, calcium carbonate, etc) do not melt well at all at cone 6. Boron-containing materials are the secret (e.g. Gerstley Borate, frits). A relatively small amount of boron added to a typical cone 10 stoneware glaze recipe (feldspar, kaolin, silica, calcium carbonate, dolomite, etc) will make it melt well at cone 6 (this is more complicated that it at first seems because there is no material that sources pure boron, it comes in materials that also supply other oxides). Zinc and lithium are also used as additional fluxes but recipes employing them have significant issues. Since much functional ware is fired at medium temperatures, it is important that your glazes fit your clay body, from a ware strength, aesthetics, safety, and functionality point of view. A visual inspection is not enough. A simple thermal shock test is suitable to bring out most crazing or shivering (click here for more info). If you need help to match a glaze and clay (doubling the strength is not unusual with a better fitted glaze) check this page. It is better to understand how to adjust one base glaze to vary its color, surface, expansion, character, etc. than to have twenty recipes that you do not understand and cannot control. Check this page for information on how to make and control your own base glaze. Visit the glazes page on this site (or at http://albertaslip.com or http://ravenscrag.com) for more info on the base glaze right for you.